Gina Abudi is President of Abudi Consulting Group, LLC. Abudi Consulting Group specializes in working with clients on strategy around projects, process, people and technology. She has worked with clients on a variety of strategic initiatives, including conducting Business Impact and ROI studies for training programs and process improvement initiatives, project management, developing strategic learning and development programs, assessing skills, and developing mentoring programs. Gina was honored as one of the Power 50 from PMI® - one of the 50 most influential executives in project management, working to move the profession forward. She has served on PMI®’s Global Corporate Council as Chair of the Leadership Team. She is currently President of the PMI® Mass Bay Chapter Board of Directors (2011 – 2013). 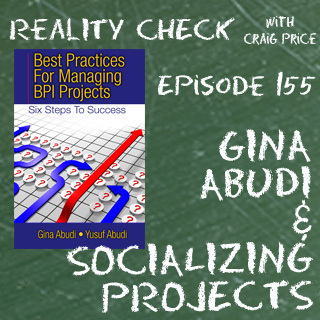 Gina presents frequently at conferences, industry events, and corporate events on business impact and ROI, developing project management best practices, building effective teams, assessing project management skills and various other leadership and management-focused topics. Gina received her MBA from Simmons Graduate School of Management. She served on the Simmons Graduate School of Management Alumnae Association Board from 2007 – 2009.